Do they actually read their own "newspaper"? 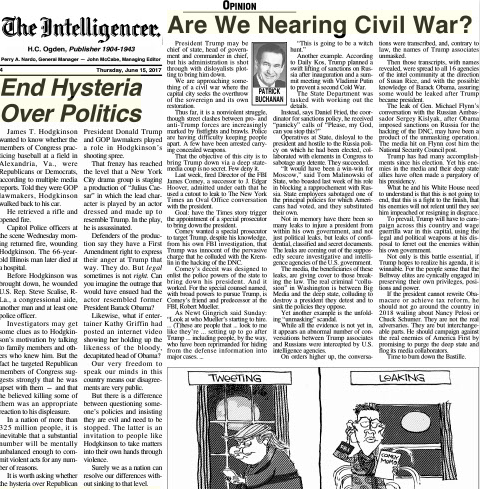 On the left side is an editorial asking us to "End Hysteria Over Politics." On the right side is a column by the xenophobic, racist, and frequently hysterical Pat Buchanan, "Are We Nearing Civil War?" Yesterday, I commented on the Intelligencer editorial that attacked Hillary Clinton's for her assertion that half of Donald Trump's followers were racist, sexist, homophobic, xenophobic, and Islamophobic ("deplorables"). The paper's defense was that she was attacking them because they disagreed with her; Trump's own . . . The front page of this morning's Intelligencer carried about 80% of the AP article on the likelihood that Hillary Clinton would win the Democratic Party's nomination. On the editorial page, however, it was business as usual as we got Patrick Buchanan's anti-Hillary column from last Thursday. I'm sometimes amazed that . . .